LUMCON’s main facility is an ideal and immersive location for research and education. 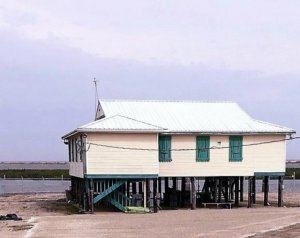 The W. J. DeFelice Marine Center is located in Cocodrie, LA., approximately 85 miles southwest of New Orleans. The Marine Center is situated in the heart of the estuarine wetland complex of the Mississippi River deltaic plain, between two active distributaries–the Atchafalaya River and the Mississippi itself. This site provides ready field access to the most productive estuaries in the United States and one of the largest wetlands in the world. In addition to the access to vast salt, brackish and freshwater marshes, the Marine Center also affords proximity to the barrier islands and offshore coastal and blue, deep waters of the northern Gulf of Mexico. The distance from a major urban center and universities also affords opportunities for retreat. Consortium faculty, students, and other stakeholders may find solitude that allows them to focus on both research and education removed from institutional distractions. The marine center’s meeting facilities and dormitories are available for education, research, and hosting meetings and workshops. For more information, contact our Associate Director of Education and Outreach, contact our Associate Director of Science, or read about our Marine Synthesis Center initiatives and funding opportunities. The DeFelice Marine Center is a modern, 75,000 square foot complex of research, instructional, housing, and support facilities completed in 1986. The Center includes 26,000 usable square feet of laboratory, classroom, office, and library space. Dormitory rooms and five apartments provide housing for up to 80 people. A cafeteria/general meeting room is situated in the center of the complex. Eight laboratories are equipped with running sea water. Six additional laboratories are reserved for dry applications and instrumentation. Laboratories are used for both research and education. Education areas include three classrooms and two teaching laboratories. In the fall of 2016, LUMCON completed renovations on a new 99-seat auditorium and flexuse space equipped with high-speed wireless, four large monitors, and both projection and audio systems. It can be configured in multiple arrangements for teaching and meetings. The Marine Center includes nearly 50 indoor and outdoor mesocosms with running seawater that allow for a variety of scientific experiments and observations. LUMCON also has extensive machine and electronic shop capabilities and staff that are available to assist in designing and constructing any equipment needed in support of research projects. The variety, adaptability, and utility of the dormitory, educational, and research spaces at the DeFelice Marine Center are unique and allow LUMCON to serve the needs of the marine science community in a variety of ways. LUMCON’s Fourchon Lab is a 2,500 square foot laboratory located on a 10 acre plot in Fourchon, Louisiana (800 LUMCON Rd). The Lab is available to Consortium members, state and federal agencies, other nonprofit groups, and marine research groups for research and education. The facility is equipped with a full kitchen, can sleep up to 16 people in 4 bedrooms, and has dedicated lab and office space. Below the building is a covered area with picnic tables, a laundry room, and a restroom. The Lab has a private dock, the property is fenced, and the fence gate can be locked.